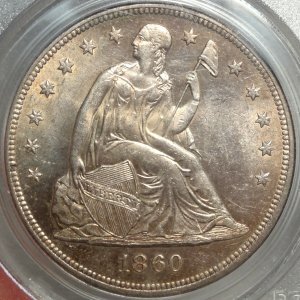 1842-P U.S. 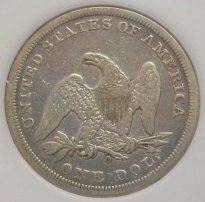 Seated Liberty silver dollar EF45 (PCGS)... An original high grade circulated example of this early date, in a series where the term "common" is relative at best...the Liberty Seated Dollars are one of the most under-rated issues of all U.S. coins. 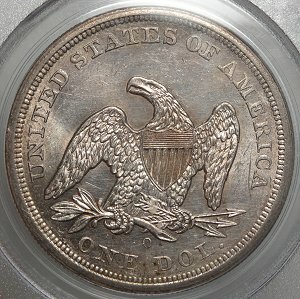 A popular type set coin! 1859-O U.S. 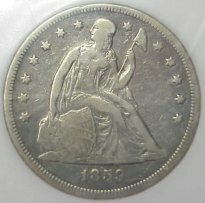 Seated Liberty silver dollar VF20 (P.C.I.)... Certified no. 7275494019: Mintage: 360,000 no motto variety. 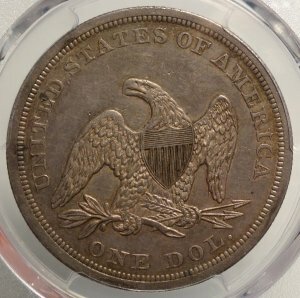 The Liberty seated dollars are one of the most under-rated issues of all U.S. coins; they are just plain hard to find in decent condition such as this example. 1860-O U.S. 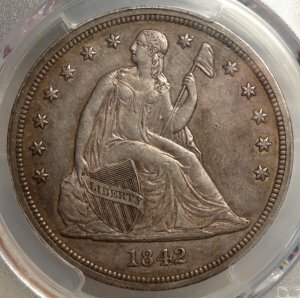 Seated Liberty silver dollar MS62 (PCGS)... An excellent original brilliant uncirculated example of this late date, in a series where the term "common" is relative at best...the Liberty Seated Dollars are one of the most under-rated issues of all U.S. coins.